Skype is an amazing app for voice calling, video calling, text messages and much more. At some point, you might want to sound different to prank your friends or protect your identity in sensitive situations. Well, it is not that simple to change your voice, but it is possible thanks to technology. There are many voice changer tools available that capable of altering the pitch and timbre of your voice, and make you sound like a completely different person. Then how to choose a good voice changer software for Skype? In this article, we have rounded up the 7 best voice changing apps for Skype that helps you to customize your voice while calling. Fake Voice is one of the most effective and popular used voice changing software that help users to changes their voice to male, female, old, young, hard, shrill, or some one new. Also you can apply robotic effect to sound like alien or echo effect to sound like you speaking from a well or tunnel. This software is completely free to use and does not take up much space on your computer. The mechanics behind Fake Voice are really simple. Basically, you are just given a bunch of sliders that you play with until you get the results that you want. If you want to have fun with your friends or improve your voice quality for audio recording, Fake Voice will give you full control over your voice. 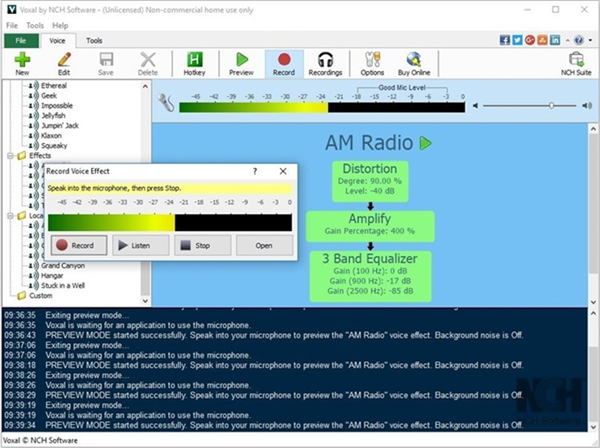 Voicemod is one of the best free voice changing software for Windows and works with almost all communication and streaming software like Skype, Discord, Twitch, TeamSpeak, Steam, Hangouts, Bebo, etc. It is an online real time voice modifier with tons of awesome voices and effects. Using this application, you can easily convert your voice into robot, alien, aphonic, baby, ogre, children to adult, man to woman, and much more. Also, you can record fun voice notes and videos for your friends to enjoy as well. This voice changing application is specially designed for Skype and used by thousands of times all over the world. It has the excellent compatibility with all Skype versions to provide smooth performance during calls. This application offers a tons of useful and interesting features. 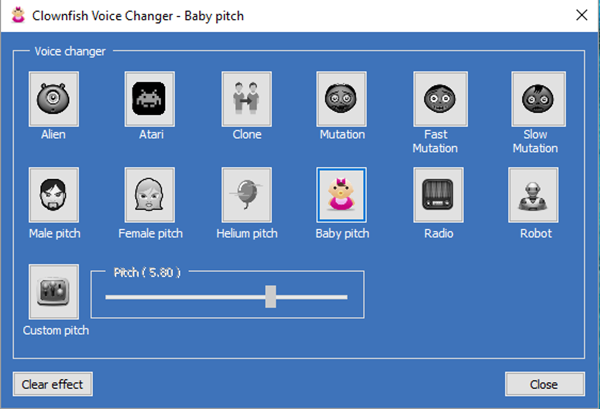 It allows users to change voice pitch flexibly from male to female with the preset voice pitch status. Also, you can download sound emotions such as kiss, heart, cry, etc. from the AthTek site for free and send them to your contacts to make conversations more interesting. 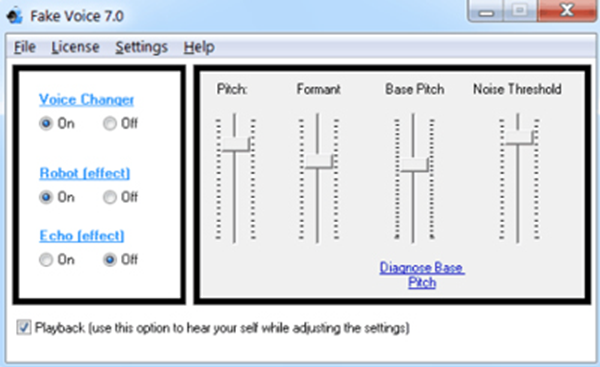 Overall this tool provides you with high-quality sound changing options. If you are looking for a funny app which can make fun of Skype voice changing, AthTek Voice Changer for Skype is the one you should never miss. If you are someone who likes to change voice as a comedic effect, then Clownfish Voice Changer is the one for you. 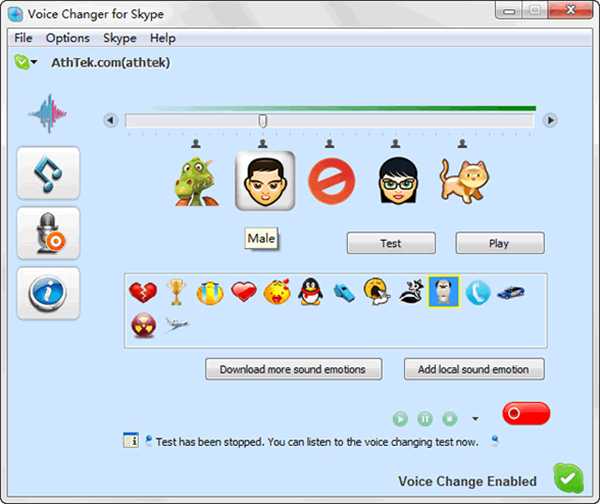 This free voice changing application can be integrated with many programs, including Skype, Hangouts, Viber, ooVoo, Ekiga, Jitsi, Ventrilo, TeamSpeak, Mumble, etc. for a real-time voice change. You can play background music broadcast your messages, add sound emotions, let a robot talk on your behalf, send greeting wishes to make your Skype conversations more interesting. Besides, this tool has a built-in spell check system as well as voice call recording feature. The messages sent using this application are encrypted, and hence they are very secure. Just as its name suggests, this voice changer software is specially designed for Skype. You can transform the sound of your original voice with the real-time effects or speak anything using a computer-generated voice. Also, this application has the feature to record any conversations, and replay any pre-recorded sounds to the person on the other side. It is free and very simple to use. All its features are divided into four sections: transform your voice, replay sounds, record your calls and speech synthesis. 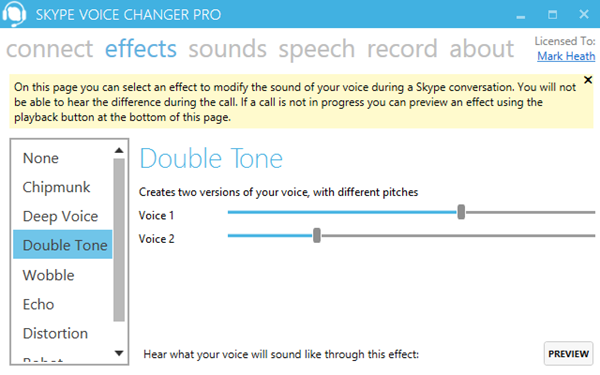 In a word, Skype Voice Changer is designed for all purposes. It is undoubtedly one of the most entertaining ways to enjoy the fun while chatting with someone over Skype. Voxal is a professional voice changing software for Windows/Mac that lets you create chains of effects to manipulate recorded vocals or apply to your voice in real time. You can use it to modify, change, and disguise your voice in any application or game that uses a microphone, including Skype. It has a massive library of vocal effects that you can choose from, including robot, girl, boy, alien, atmospheric, echo and many more. 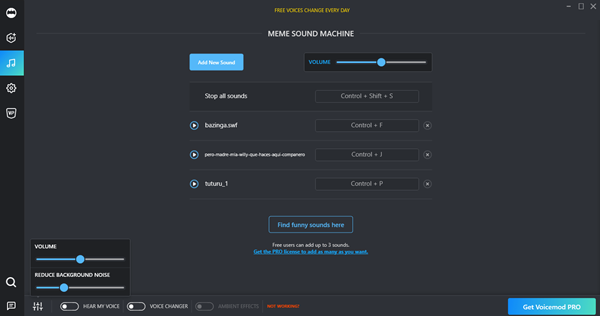 And you even have the option of creating unlimited custom sound effects, as well as text-to-speech messages. This application has very simple and intuitive interface, accompanied with small download size. 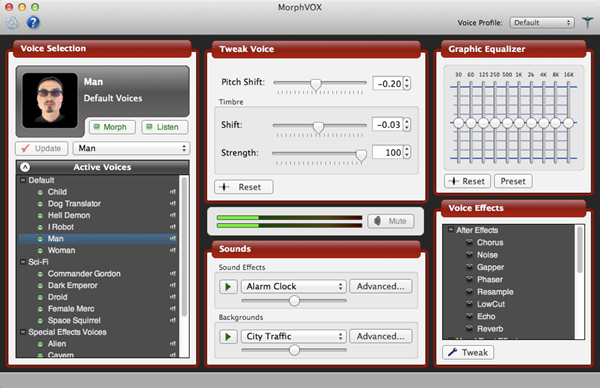 MorphVOX is a desktop voice changer software that works in real time as you speak and you can use it in instant messaging application like Skype, Ventrilo, TeamSpeak, Yahoo Messenger, as well as online games like Warcraft, Counter-Strike, Battlefield 2, etc. Like other voice changing apps on this list, this tool allows you to turn your voice into whatever you desire. It features a Quick Effects button which lets you apply any effect to your voice. Also, its Quick Voices feature allows you to switch your voices instantly and After Effects feature helps you to add environmental sound effects to your conversation. You can even add your own custom background sounds to the library. So these all are the 7 best voice changing apps that will help you to change your voice for Skype. Using applications likes these to add a little bit of fun to your daily conversations. It is a great way to prank your friends and families. All of these applications are reliable and easy to use. Just choose any one you like and start changing your voice on Skype.